An all-cotton yarn dye Breton stripe looks refreshingly modern in a bold graphic scale and classic navy and white color palette. 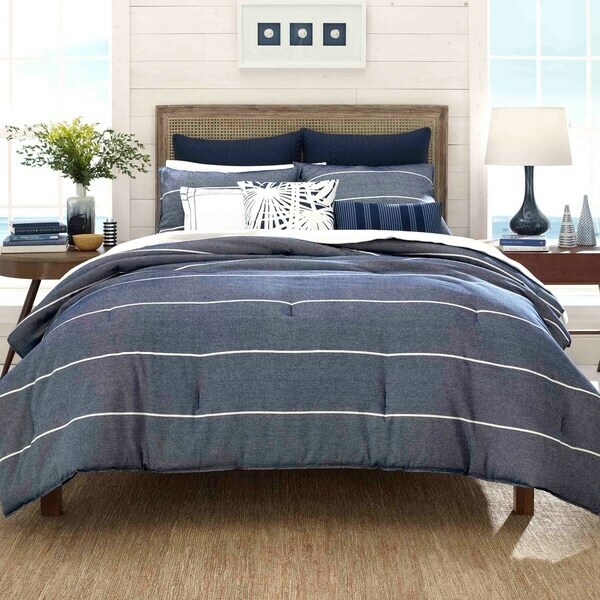 The chunky chambray weave softens the navy in contrast to the crispness of the white stripes, adding depth and interest to the comforter and standard shams. Chevron lattice quilting on the solid navy European shams sets a tone of tailored details that carry through on accent pillows embellished with pick stitch stripe and embroidered frame borders. A third decorative pillow features a palm leaf graphic embroidery in white on navy, adding an unexpected note of pattern play into the classic stripe mix.